The Tea Dance is a volunteer lead activity. We have a qualified dance instructor. 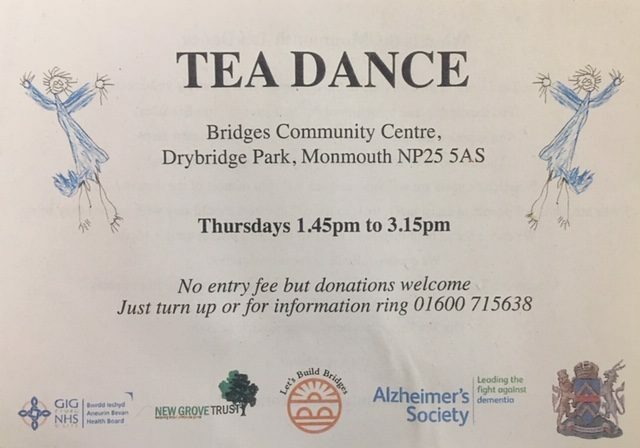 It is for everyone in the community, attended mostly by the elderly some with dementia and people / children with learning difficulties but also people wanting to dance get fit and socialise. We have volunteers but if someone normally has a carer they must come with them. There is no charge but we do have a collection box that we rely on people giving to. People using wheelchairs are involved in the dancing. It’s a welcoming, mad and fun activity. Just turn up at Bridges Community Centre on a Thursday afternoon.